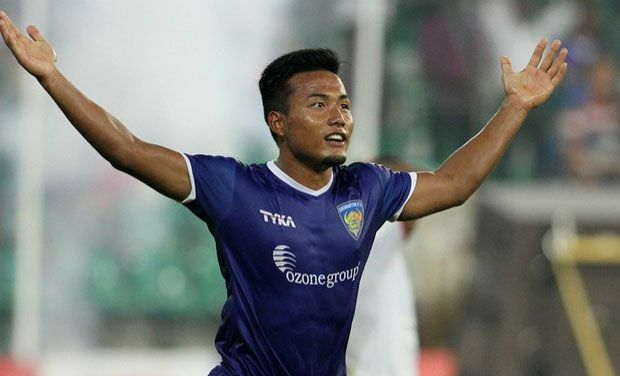 Jeje Lalpekhlua has been nominated as the ‘2016 AIFF Player of the Year.’ The announcement was made by Mr. Praful Patel, President, AIFF at the AIFF Annual General Body Meeting held at the AIFF Football House in New Delhi on Wednesday (December 21, 2016). He will be presented a prize of Rs. 2.5 lakh along with with the glittering Trophy. An elated Jeje mentioned to www.the-aiff.com that he was “honoured” on being chosen as the ‘2016 AIFF Player of the Year.’ “This year has really gone great for me. This award is another motivation for me to reap more in the future,” he stated. Furthermore, Sasmita Malik was conferred with the 2016 AIFF Woman Footballer of the Year. The Odisha-based footballer will be bestowed with a prize of Rs. 2 lakh besides a Trophy. “I thank the AIFF for their constant support and help. I revere the Awards lauded to me by the AIFF a lot and these are the things which matter the most to you as a Player,” she told www.the-aiff.com. AIFF inducts two '2016 AIFF Award for Special Recognition' awards for Gurpreet Singh Sandhu and Uvena Fernandes. They will be bestowed with Rs. 1 lakh and a trophy apiece. Gurpreet represented Stabaek FC in the Europa League, first Indian to feature in a Europa League fixture whereas Uvena Fernandes is the first Indian Official to officiate in a World Cup final match. She officiated the FIFA U-17 World Cup 2016 final in Jordan. “As a Player, it’s my duty to give my best. Being conferred with such an Award means a lot to me. The recognition motivates me further,” he maintained. Sanju, an integral part of the team who won the South Asian Games 2016, was being honoured with the '2016 AIFF Emerging Women Footballer of the Year' award. “I am in loss of words having received the news of the award. It means a lot to me and I am so happy that I could achieve this. I thank the AIFF for their constant support and exposure. And without a platform provided by the AIFF, I don’t know where I would be,” Sanju opined. The ‘2015 AIFF Award for long-time contribution to Indian Football was awarded to Nike. Pranjal Banerjee from IFA won ‘2016 AIFF Award for Best Referee’ along with Joseph Tony was awarded the ‘2016 AIFF Award for Best Assistant Referee’.